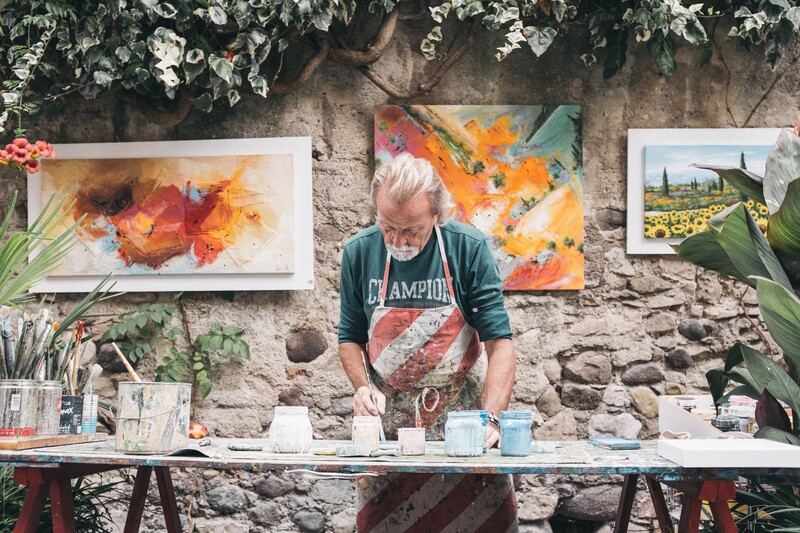 According to the Guinness World Records, the most prolific painter of all time is a Spanish painter named Pablo Diego José Francisco de Paula Juan Nepomuceno de los Remedios Crispín Cipriano de la Santísima Trinidad Ruíz y Picasso (how’s that for a tongue twister?). To most, he is better known as Pablo Picasso. Born in 1881, Picasso received his first art lesson at age seven by his father, a painter who specialized in doves and pigeons. Although his father enrolled him in a premier art school, Picasso quickly dropped out at 16 to pursue his own work. Throughout his life, Picasso underwent different artistic phases: the Modernist Period, the Blue Period, the Rose Period, the African Period, Cubism, and then Neoclassicism. Each of these periods reflects his changing artistic style and how he experimented with various artistic forms and color palettes. Picasso tried his hand at just about every art movement that existed in the 20th century. By the end of his career, Picasso left a legacy of 13,500 paintings, 100,000 prints and engravings, 34,000 book illustrations, and 300 sculptures and ceramics. Amongst those works, his most notable paintings include La Vie, Guernica, and The Weeping Woman. Pablo Picasso, along with Vincent van Gogh and Andy Warhol, top the list of represented artists in the most expensive paintings sold in auction. Picasso’s most expensive painting, Les Femmes d’Alger, translated in English as The Women of Algiers, was auctioned for $179.4 million in 2015. Throughout the 91 years of his life, Picasso was celebrated for his artistic accomplishments. Unlike many other artists, he also became wealthy within his lifetime. Picasso eventually became one of the most influential artists of the 20th century. In a career that lasted 75 years, how did Picasso create so prolifically? All his paintings, illustrations, and sculptures add up to a total of 147,800 works. Over one year, that number averages out to around 1,970 works. If you break that number out to days, Picasso produced around 5.4 works each day. Consider that for a moment. He wasn’t reading about painting, thinking about painting, or watching someone else paint. Picasso was painting. He was creating, on average, over five works every single day of the year. It’s daunting to imagine someone producing so much on a daily basis. Of course, not all his works were epic masterpieces. Many of them were rough sketches that might have taken twenty minutes. But the fact still remains: Picasso got a lot done in his lifetime. Let’s take another example to compare. A friend of mine had taken weekly violin lessons for a decade. Yet, her skill level was significantly worse than someone who had been learning violin for the same number of years. Why? “How often do you practice?” I asked. “Every week,” my friend replied. “And you only practice when you’re at your lesson?” I asked to confirm. Later, she attributed the other person’s musical proficiency to natural skill. But after having that conversation, it was obvious there was more to this story than simply a discrepancy in talent. Listening to someone’s instruction is easy. But taking that feedback and putting it into practice is much, much harder. And while there’s a lot to be said about the power of innate qualities, persistent practice makes a world of difference. How Much Do You Create? Now, think about your own habits for a second. While absorbing information is important for growth, you also need to use what you learn to create and share with others. What’s the ratio of time that you consume versus the time you create on a daily basis? When you wake up, what’s the first task you need to do? As you can see, consumption is not a bad thing unto itself. Just as regular exercise is vital to health, so is eating. Unfortunately, many of us spend our time reacting to the things that happen around us instead of using our limited energy to create. I remember a teacher once said that every hour of instruction should be accompanied by at least five hours of practice. Those valuable lessons can’t be fully absorbed unless you reflect on it, practice in your own time, and use feedback to improve. For instance, you can read all the manuals available on driving. You can sit in the passenger seat. You can ask the driver how to drive. But if you don’t step in the driver’s seat yourself, your skill will always stay at a certain level. When you reflect back on a typical day, think about the amount of time you spend allowing things to happen to you. Now, compare that to the time you spend brainstorming, practicing, and generating things of your own. It’s easy to sit back and watch others do or to imagine yourself doing something. But if you want to accomplish a goal, you need to put in the work. What are you up to today? For every hour that you’re taking things in, are you spending more hours putting things out? Do you let things happen to you, or do you proactively make them happen? When we try things, we don’t always get it right. We spend our time headed in the wrong direction. Our actions lead to adverse results. That’s how it is sometimes — the more risks you take, the more likely you’ll make mistakes. And they will happen. But once in a while, something special happens. Out of those thousands of hours of effort, you might actually get the result you want for once. Or, your result might even exceed expectations. Out of Picasso’s 147,800 works, less than a dozen became notable works. Imagine that: over a 75-year career span, maybe one piece of art emerged as a masterpiece for every tens of thousands of works produced. Creating is frustrating. It’s tiring. It can even be painful. But when you push through those difficulties, you’ll find that creating produces greater rewards than consuming in the long run.